Looking back on those dark, horridly smoggy days in Donora in 1948, one tends to think first of the smoke, the dirty, dusty, sooty smoke, with all of its toxins, pouring out of the smokestacks of the zinc, steel, and wire mills that dominated the valley back then. One tends not to think much or often of the other elements involved, those that, together, set up so perfectly the tragedy that befell the town. Among those elements was the wind, of which there was virtually none. If even a slight breeze had strolled through the Donora valley that week the smoke would have broken up, giving residents some respite. 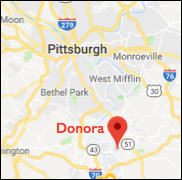 But no, there was no breeze to be had, not in Donora, nor in Monessen to the south, nor in Monongahela to the north. There was, in fact, nary a breeze to be had throughout the entire Northeast that week. The image below is part of a national weather map from September 29, 1948, a month before the Donora tragedy. The black lines, marked here by orange arrows, indicate general wind speeds. The closer the lines, the greater the wind speed. On this day the wind was pretty much normal, with light breezes along the eastern U.S.
Now look at this map from October 29, in the thick of the smog that killed so many in Donora and Webster. Note how far apart the lines are. Wind bands are almost non-existent, and in the Donora valley along the Monongahela, there was no wind whatsoever. The absence of wind at ground level prevented the natural upward movement of smoke not just from the train but also from the nearly dozen 200-foot-tall smokestacks of the various mills. It wasn’t for another two days, on Sunday — Halloween — that Donorans felt their first puffs of wind in six days. That Sunday a cold front (blue arrow, right) moved in from the west and brought with it a slight breeze, light showers toward midday, and then a steady rain later. Between the wind stirring the lifeless air and water droplets washing the soot away, the fog lifted and the air returned to what Donorans considered rather more normal. ← Who Died in Donora’s Deadly Smog?